Self-managed villages of tiny houses can address many of the ills of homelessness, middle class struggles, civic belt-tightening, sustainability, quality of life issues, and more. Andy Heben is a pioneer bringing this vision into the world, especially in the US, with good research and on-the-ground accomplishments behind it. His new book “Tent City Urbanism: From Self-Organized Camps to Tiny House Villages” is a game-changing breakthrough envisioning co-intelligent housing that works for all now and into the future. Andy Heben has a vision that will positively impact homelessness, economic hits on the middle class, state and local budget woes, loss of community, the transition to a post-carbon society, and much else. At its heart we find self-managed communities of tiny houses that share common spaces and resources. Andy co-founded the already influential Opportunity Village by and for homeless people in Eugene Oregon last year and has just published a book, “Tent City Urbanism: From Self-Organized Camps to Tiny House Villages”. I know Andy. He’s been a co-op housemate of mine for 3 years. His membership in the coop and his participation in a 2012 Open Space Conference on community resilience organized by the Co-Intelligence Institute connected him with the homeless advocacy movement that emerged from Eugene’s Occupy encampment in 2011 and gave birth to the community-supported establishment of Opportunity Village. Andy spent much of the previous year traveling around the US investigating homeless camps and living with homeless people for his senior thesis, so he was able to contribute vital vision, community organizing, village and housing design, collective self-management expertise, and on-the-ground construction work to help make Opportunity Village a reality. He has woven all this experience into his new book which uses the homeless situation as a platform from which to launch a vision that reaches far beyond homelessness into the future we all share. I have been so inspired by Andy that I worked with him for some months earlier this year helping get his book edited and published. I consider this one of my more important contributions to future generations. In the face of peak oil and the demands of sustainability, city planners face the challenge of increasing urban density without lowering – and hopefully increasing – quality of life for residents. The recently emerging tiny house movement is getting lots of buzz in the media, as both economic and environmental concerns inspire more middle class people to downsize into houses under 1000 square feet. Advocates argue that it could help address the sustainability/density challenge, as well. The co-housing movement creates resident-designed and -owned housing clusters with shared spaces, activities, and equipment. Co-housing was innovated in Denmark in the mid-sixties and launched in the US thirty years later. It satisfies desires of some middle class people for more community and lower ecological footprint, but has in most cases proven too expensive for less affluent people. Populations of homeless people are rapidly increasing in the US and elsewhere, especially driven by economic dislocations. Homeless people have diverse situations and needs that resist single solutions. The “homeless problem” is taxing financially strapped communities, whether their strategy is to try to satisfy those needs or to harass homeless people into invisibility, sometimes even making homelessness illegal. Meanwhile, the problem grows. Andy’s tiny house village model would make co-housing affordable for all. It would provide people choosing to simplify into the tiny house lifestyle with a community of like-minded fellows with whom to co-create and share. Intelligent inclusion of the mini-house village design into urban planning would make possible increasing density and sustainability while increasing quality of life for those involved. And as our whole society downshifts its physical consumption – by decision or default – to meet the constraints of a limited planetary support system, the idea of close-knit communities of tiny low-impact homes, collaboration and sharing provides one of the most benign models available for sustainability, combining modern know-how and sensibilities with the ancient village patterns from tribal and early agricultural cultures. I see Andy’s vision as a game-changing innovation that is especially potent because it addresses so many issues simultaneously while tapping into existing needs, energies and trends, resolving many of their internal contradictions with collaboration and collective intelligence. Along with documenting and articulating the roots of this budding movement, the book provides a practical guide to help catalyze new and existing initiatives in other areas. Much like the bottom-up initiatives presented within this book, the book itself has been published independently. So it will take a grassroots movement to spread the word about this new housing paradigm. You could play a significant role in this.Please consider sharing this information with your networks to inform them about this new book and the exciting possibilities it brings to light. BRING ON THE TINY HOUSE VILLAGES! A new book takes a look at how tent cities organized by the homeless are opening the doors to sustainable housing options. Eugene, OR – Homeless encampments, commonly known as tent cities, have been reported to be on the rise in the United States since the economic recession, and Andrew Heben believes that tiny house villages provide a solution. His new book, Tent City Urbanism: From Self-Organized Camps to Tiny House Villages, tells of how those experiencing homelessness are pioneering these low-cost, low-impact developments in cities throughout the country. Tent City Urbanism provides a fresh take on homelessness, leaving the reader with cost-effective models for transitional and affordable housing that are within the grasp of local communities. This is achieved by combining the positive social dynamics that Heben has found present in many tent cities with an improved infrastructure in the form of tiny houses. Portland’s Dignity Village, Eugene’s Opportunity Village, and Olympia’s Quixote Village have blazed the trail for this unconventional form of development, and the concept has since emerged from the Pacific Northwest to inspire projects like Madison’s OM Village, Ithaca’s Second Wind Cottages, and Austin’s Community First Village. Heben is a co-founder of Opportunity Village Eugene, a non-profit organization that puts many of the ideas presented in his book into action locally. Opportunity Village opened in August 2013 and now provides transitional micro-housing to 30 otherwise homeless individuals and couples at a time. The organization is now planning its next project, Emerald Village, which will apply a similar concept to long-term, affordable housing. 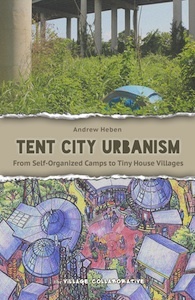 Prior to this, Heben traveled throughout the country studying more than a dozen tent cities—including a one-month stay at Camp Take Notice in Ann Arbor, MI—as part of his award winning urban planning thesis at the University of Cincinnati. He found that the informal settlements often exemplify self-management, direct democracy, tolerance, mutual aid, and resourceful strategies for living with less. His new book compiles these four years of research and experience to define innovative models for addressing homelessness, housing affordability, and sustainable development. You can get a copy of the book from the author’s website, Amazon, or locally in Eugene at Tsunami Books. For all media inquiries please contact Andrew Heben at hebenaj at gmail. com or <937> 681-8044. June-July 2014 Co-Intelligence Institute Fundraising Campaign note: So far 43 people have supported us with $6160. Join them in supporting our work. Our target is $20,000. As you can see, we can use your support. Please donate now. It will make a big difference and your donation is fully tax-deductible in the U.S. and – thanks to a challenge grant – all new donations up to a total of $5000 will be doubled.